A very cool and smart movie that is both gritty and intense as it tells three stories, all of them connected nicely throughout time. This movie is much smarter and more creative than it looks. It’s actually a unique experience watching a movie unfold to tell three stories that are all completely connected as one ongoing story that spans time. Of course we’ve seen movies that tell three different stories about three different characters with slight connections here and there before, but this is not that. This is taking it up a notch. We get the story of a criminal that spins into the story of the man who went after him. And then we end with the story of the sons, but what makes it work is that the characters from the other stories are in this one too. so, for example, Bradley Cooper is in all three stories and eva mendes is too. this is an experiment of a film and it only really works because all three stories are good and entertaining in their own way. some moments are better than others, but unltimately it’s a very cool film. 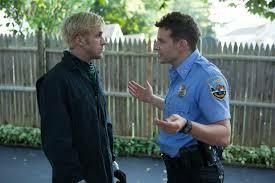 The Place Beyond the Pines is a great movie. I didn’t really expect it to be based on a number of factors, and I was proven completely wrong. Obviously the movie stars likeable actors, which is always a plus. From Ryan Gosling, who constantly picks interesting roles, to Bradley Cooper and Eva Mendes, two of the world’s best looking people, this one was ready to go. Especially considering the supporting cast that included Ray Liotta, Bruce Greenwood, Rose Byrne, and Dane Dehaan. And yet despite this cast, the movie looked like it would be slow. Maybe that’s because it was directed by the guy who made blue valentine, (which I have not seen yet, but hear is more artistic and slow than it is exciting or lively.) another reason for that was the trailer, which showed lots of shots of characters just riding or driving through the woods, making the whole thing feel very peaceful and relaxed. Finally, there was what I had heard about the plot. the word was that the plot here involved three stories. the first was the ryan gosling story. the second was the story of bradley cooper’s cop. and then the third story was set about ten years later and was the stroy of ryan gosling’s son. it seemed like the three stories would only have a loose connection to each other to start each one of them off, and then each would go in it’s own direction and tell it’s own story, separtate from the rest. that idea sounded more annoying than interesting. Luckily, the movie doesn’t do that. Instead of really telling three stories, this is actually all one story, only kind of told from three different points of view. The single story continues on as we jump around from one character to another, and yet all characters from previous stories appear in the new one, each time the movie continues on. This isn’t a movie where a character from a previous story will just pop up in the background during a new story, for us to recognize that the previous story was going on at the same time as this one. Instead, characters from past stories don’t just appear as side players in the new ones, but they are actually major parts of them. Basically, when it comes to storytelling, this movie does everything right. It is very smart and well-structured and put together. The first story is about ryan gosling’s character, luke, who is a motorcycle stuntman performing at fairs. when he finds out that he has a child, Luke decides he wants to support the woman (romina, played by eva mendes), and be with her. he knows this motorcycle gig won’t pay enough to support his family, and meets a guy who has had experience robbing banks. this guy shows him the ropes and together the two of them go at it. and then the story changes to about ten years later or so, and we are with the sons in highschool of both luke and avery. as it turns out, these two kids are friends and they get into trouble together, stealing and doing drugs. when avery finds out he tries to steer his son away from luke’s son, jason (dane dehaan), but it’s no use. things get pretty heated when these boys find out who their fathers are and the backstory that went on between their fathers before these two even knew how to walk. the glue that really holds all of the stories together is the eva mendes character, romina. she has her biggest part in the luke story, playing the love interest, but really appears in all three stories. during the avery part of the movie, ray liotta brings avery along on a raid of romina’s house, looking for the money that luke stole from banks and gave to her. and then during the jason story, it is romina who has to deal with what is happening to her son and the path he is going down. 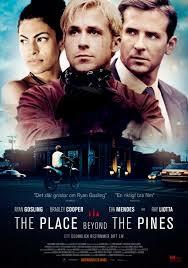 a place beyond the pines is a gritty and intense movie. it is also very smart. most movies today get bogged down by formula so that even if they have a creative initial premise, they end up molding into the same old thing long before their climax and end. this movie is completely different. it is original in the way that it presents three stories which are all connected as one story, just spanning over time. the changing of perspective from who each story is focussed on helps keep things constantly fresh. and all three stories are smart and exciting, yet different from the others. this movie really works.